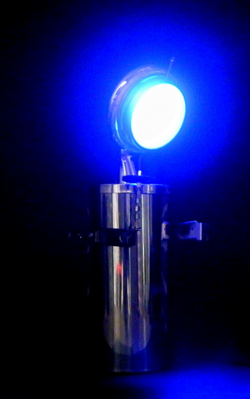 Sa tête est un pommeau de douche sur lequel j'ai fixé un couvercle de bougie en boîte en métal et verre que j'ai dépoli, elle contient un cluster de LEDs bleues. 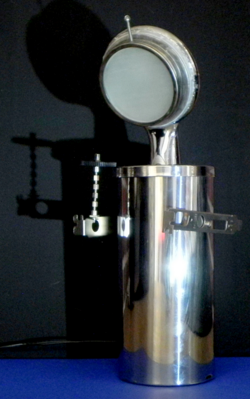 The body of Δ2Ο was made from the lower part of a toilet brush holder in polished stainless steel. I cut it to size and attached two pieces of metal taken from a hard drive. One carries a flower made from a gear. Δ2Ο’s head was made from a shower head upon which I fixed the glass lid from a candle in a tin. I frosted the glass part of the lid using sandpaper. It contains a cluster of blue LED lights. I love the intensity, yet at the same time, the simplicity of this robot. The lighting is simply amazing. With it's head slightly bent forward and its arms open I can't help but be reminded of the Virgin Mary. Well done on this super piece ! Merci, moi aussi j'aime bien sa ligne toute simple. Lumière sur-réaliste, non ? C'est magnifique et la photo parfaite, as usual, le met très bien en scène ! Tout à fait, j'aime beaucoup cette photo et mon photographe officiel s'en est bien tiré.